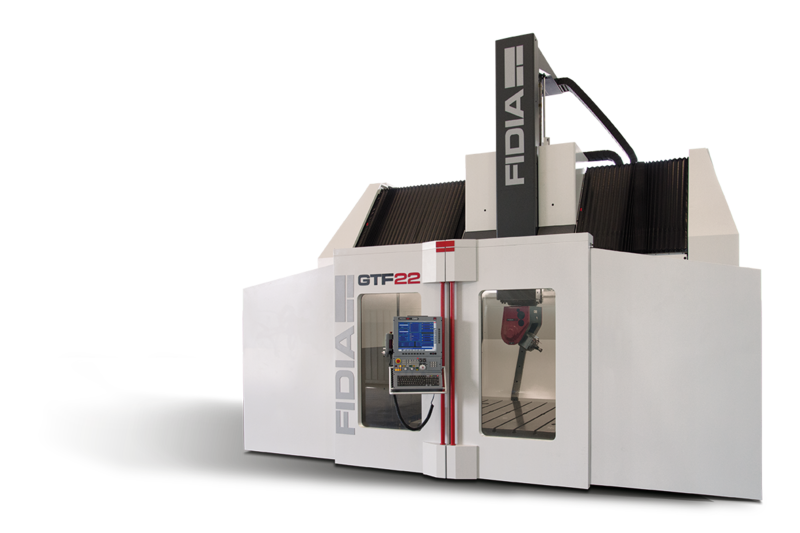 GTF Range | FIDIA S.p.A. The upper Gantry GTF line is characterized by great versatility. 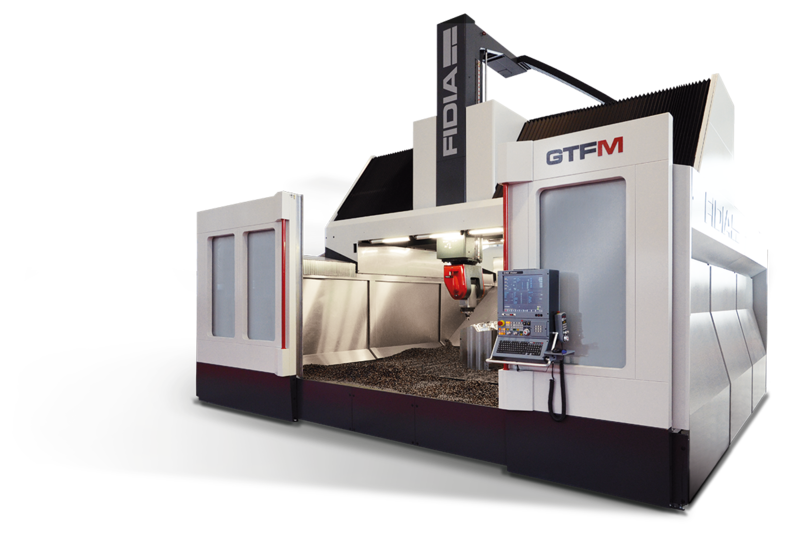 Thanks to its modular structure, and taking advantage from a combination of components conveniently selected according to weight, stiffness and cost requirements, the GTF range becomes an ideal solution to fulfill all Customers’ demand. The harmonious sizing of its structures in accordance with the thermo-symmetry concept, perfectly matches with the extremely dynamic linear axes. Rack & pinions driven by double motors and variable preload grants for total absence of backlash. 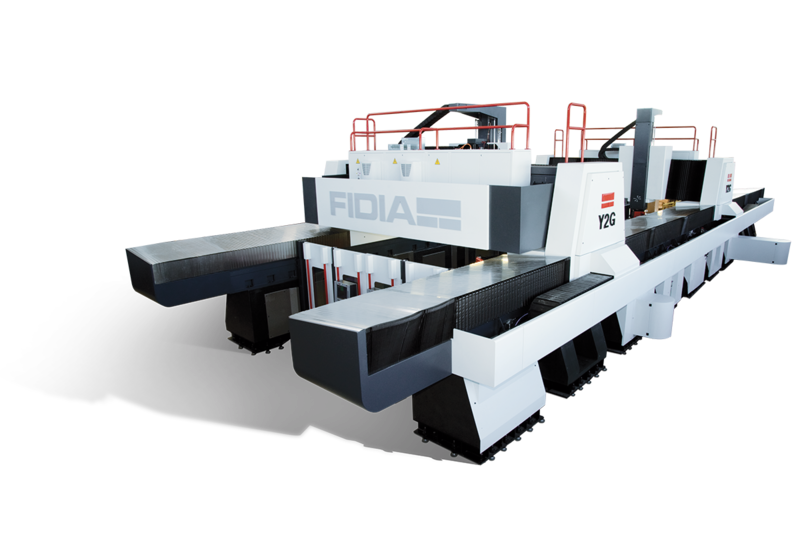 The FIDIA integrated technology system, including both drives, and numerical control, offers the most complete and performing equipment, granting the customer with both quality and reliability of one-single-source supplier. High accuracy and efficiency in 5 axis machining is essential for operating on many types of aeronautical and aerospace structural components. GTF has specifically designed solutions to afford machining of each material utilized in aerospace: ALUMINIUM, TITANIUM, COMPOSITE MATERIALS require chip conveying systems with filtering and protections for both the environment and the machine itself. In the GTF family there is always the right model to fit in the best price/performance ratio. 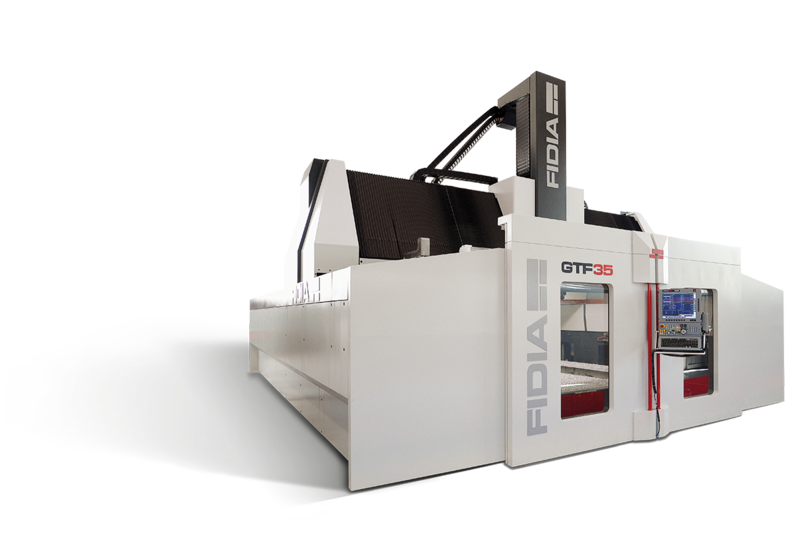 Thanks to the modular design it is now possible to utilize FIDIA technology to produce large size mechanical components. A typical example is the wind-turbine power generator: from the blade forming mold to the gear and its casing. Energy as well as Naval or Rail industries sometimes require very accurate machining cases, which can only be accomplished by specifically designed machines. The M5H head version offers the most advantageous solution in terms of stock removal rate combined with high quality and precision. The addition of tables and accessories for turning further extends the application field of these machines. The automotive industry requires powerful and highly accurate machines to mill cast-iron and steel dies from the roughing operation to the final super-finishing thanks to GTF's fixed table-upper gantry configuration, manual polishing can be mostly avoided and all operations can be done with a single set up of the workpiece. The most difficult areas of the component are attained by an appropriate choice of heads and milling accessories. This type of moulds pursues either precision in details and high surface quality. 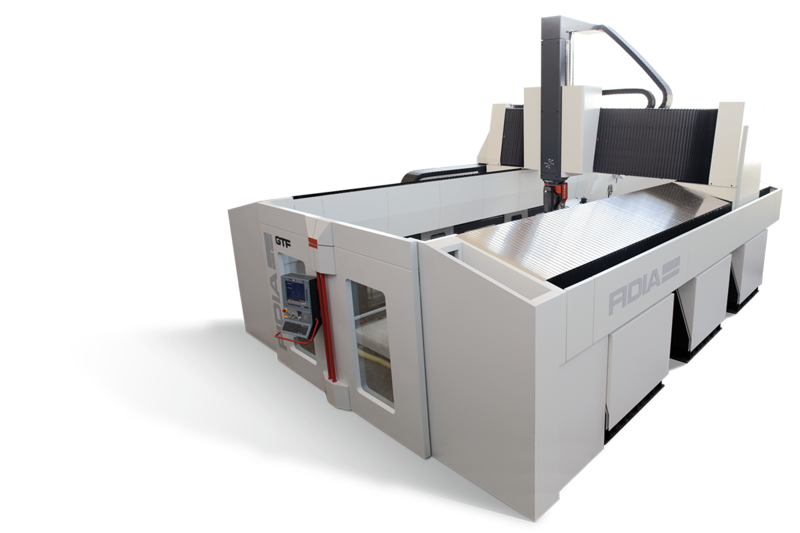 The unique design of the bi-rotary head of Fidia reduces the tool length, avoiding vibration and thus improving the surface quality. The use of direct encoders and a complete thermal control of structures grant for the highest positioning accuracy during the long milling cycle time required by these complex applications. The machining of full-scale models for automotive industry, the construction of prototyping moulds and quality control gauges match perfectly with the GTF working envelope and technical solutions. The XYZ axes high dynamic accuracy and the compact size of M5A & M5C heads bring GTF to an upper performance level, defying all competition. In order to work all the type of "light materials"as: resin, carbon fiber, clay, etc.., a range of suitable dust suction equipments are foreesen. Those equipments guarantee a high efficiency of suction performance and a total respect of the work environment.